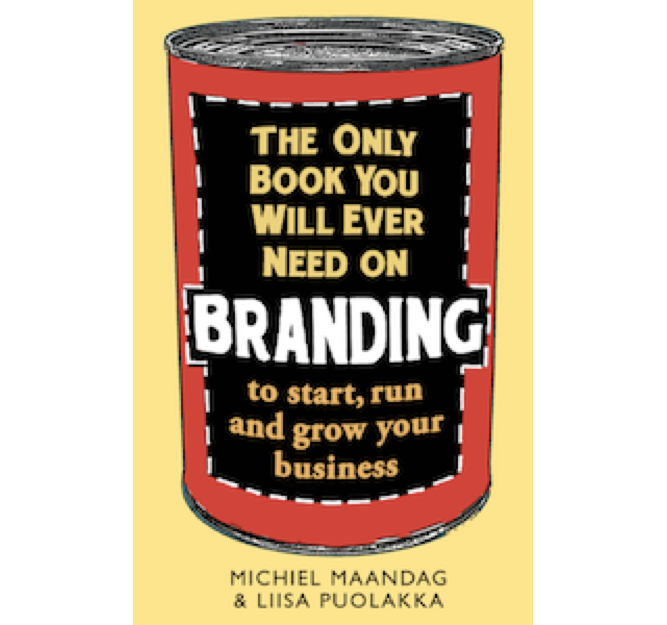 I am extremely proud to tell you that The Only Book You Will Ever Need on Branding is available as paperback and ebook with Little, Brown Book Group in the UK and on 28 December in India with Hachette India. 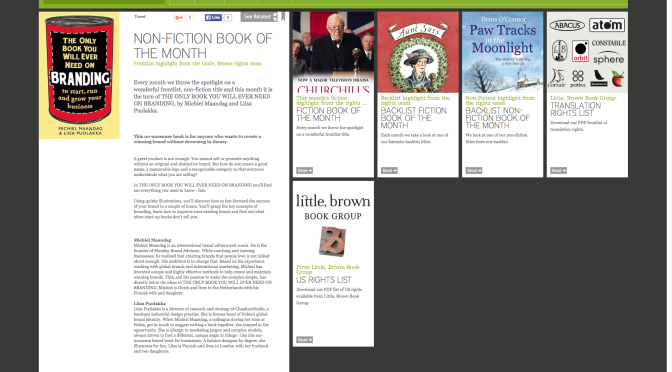 Not only that, the book is chosen as the Non-Fiction Book of the Month December. We never expected that to happen, because it is a book about branding after all! I have had the ambition to write a book about branding in a down to earth no-nonsense approach since starting this blog in 2009. During my coaching sessions with international startups at the global accelerator program AppCampus I noticed that my visual training materials and concepts were really helping and I believed there was enough material for a new type of brand book and started writing. In March 2013 I called my ex-Nokia colleague Liisa Puolakka who is based in London with the question if we could do this together. The idea was to get it ready over the summer. 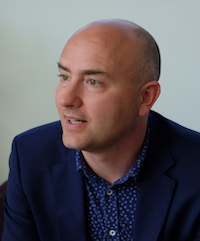 That we did not make… the ambition was to really deliver an no-nonsense book about branding. The mental test for every page was if anyone with a business to run, whether a café owner or a tech start-up, could pick up this book and start applying it, immediately and literally on the run, without a need for a prior degree in marketing and branding! We checked again and again that we were really focusing on telling the reader HOW to do things, not focusing on WHY to do things and the academic theories of branding. In November 2013 the book was in good shape. Our first reviewers provided us invaluable feedback that we used to sharpen some of our messages including the illustrations. We did not make fundamental changes to the story or any of the book’s messages, not because none of the feedback suggested it, but because we had debated the whole book between ourselves from all angles so many times that we truly had no doubts about it. Our initial plan was to rock Amazon CreateSpace. That approach changed when we got in touch in December 2013 with Suomen Liikekirjat, a publisher in Finland. Entrepreneurship in Finland had been growing rapidly, yet there was no book to support these businesses on building a brand. The publisher saw immediately value in helping to change the technical product mindset of entrepreneurs to more of a branding & marketing mindset. The book launched in Finland in April 2014. We were super happy! Being Dutch it was only natural to reach out to Dutch publishers. So, in the same month we contacted Haystack, a Dutch publisher. We immediately had a click with their website, the type of books and approach. Interestingly enough Haystack was immediately on board as well. It took literally 4 hours from sending the manuscript to getting the phone call with the message “let’s do it!” – finally a book about branding that everyone would understand! The Dutch version of the book was a success. It reached position 45 out of 28.000 management books and stayed for 25 days in the top 100. Readers awarded the book with 5/5 stars. In March 2013 I called my ex-Nokia colleague Liisa Puolakka who is based in London with the question if we could do this together. The idea was to get it ready over the summer. That we did not make… the ambition was to really deliver an no-nonsense book about branding. The mental test for every page was if anyone with a business to run, whether a cafe owner or a tech start-up, could pick up this book and start applying it, immediately and literally on the run, without a need for a prior degree in marketing and branding! We checked again and again that we were really focusing on telling the reader HOW to do things, not focusing on WHY to do things and the academic theories of branding. Our dream has always been to enter te big markets and reach as many business owners as possible. So, we knew a publisher in the UK would be needed. While we do not had an agent (a must in the UK to get your book published!) we approached Little, Brown Group (part of Hachette) anyway… and the same thing we experienced in Finland and the Netherlands happened again… the publisher loved the book. With everything… there are people who love what you are doing and people who hate it. Don’t focus on the haters… Our experience so far is that business owners & CEO’s love the book (check out our reviews), corporate marketers and brand consultants don’t. The fist group loves the focus on the HOW, the latter misses the details of the WHY – which means that the book seems to have met the needs of its target group! To me the BIG lesson was that you must envision the end goal. The end goal for us has always been to reach as many people as possible. That is our focus. The road to it is very important, especially the starting point. Our publisher Hannu Palmu from Suomen Liikekirjat had trust in us and the book. With that trust we gained trust in the Netherlands. With the success in the Netherlands we gained trust in the UK… So, make sure you have proof points along the way on the path of realising your dream and don’t give up. If it does not feel right, it likely is not right. Change direction and stay determined to reach your envisioned end goal!